Review: Set during the German occupation of France in the 1940’s. A romance blossoms between Lucile Angellier, a French villager, and a German soldier, Bruno von Falk. Based on the best-selling book by Irene Nemirovsky. She wrote this novel just before being deported to Auschwitz where she died in 1942. Just before being deported she gave the manuscript to her daughter to keep. When the author wrote this novel she was heavily influenced by the Tolstoy novel War and Peace (TV mini-series 2016) and wanted to write something similar to that story. This is mainly a story about the power of love and the tragedy of war. Kristin Scott Thomas is terrific in this film. The production design is very good. 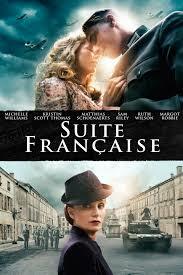 It depicts French rural life under the Nazis very well. There is a scene in this where Matthias Schoenaerts is playing the piano. He actually played the piano when he was a kid, so he had a little basis, but he wanted to learn how to play for real in the film. As well as learning the piano for this film he also learnt how to speak German.